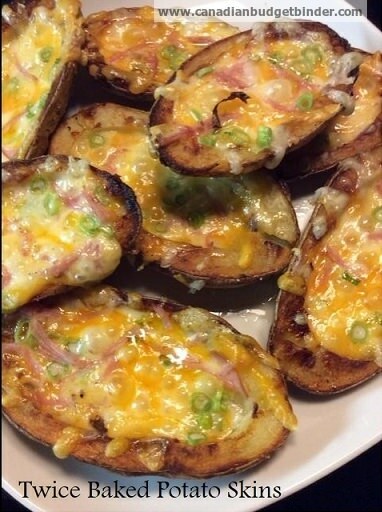 You haven’t tried twice baked potato skins before? Well you are missing out but today I have a potato skin recipe that you will add to your recipe list, that I can guarantee. Everyone loves potatoes whether they are mashed with gravy, fried in a pan until golden, baked until fluffy, roasted in juices, grilled until perfection or fried and loaded with salt and vinegar. Heck some people like to eat raw potatoes too! You come home from work and you are looking to make a quick dinner then this twice baked potato skins recipe is easy, simple and frugal all rolled into one. It’s perfect for a quick week-night meal or even for snacks while watching your favourite game or movie. Sure there are twice baked potato skin recipes on the internet but nothing as perfectly baked and crunchy as this potato skin recipe. We all get a bit bored having potatoes served up the same old ways like above so today I’m going to share with you my hubby’s best twice baked potato recipe to date. I always try to make a large amount of twice baked potato skins if I am hosting a gathering or going to a backyard bbq or pot-luck party because I know they won’t last. The twice baked loaded potato skins is the top request when we go to pot-lucks and is always the first to be cleared from everybody’s plate. I can always count on people asking if there are any left or they have put first dibs on the last ones on the tray. These twice baked potato skins so easy to make and take just over an hour from start to finish to prepare. 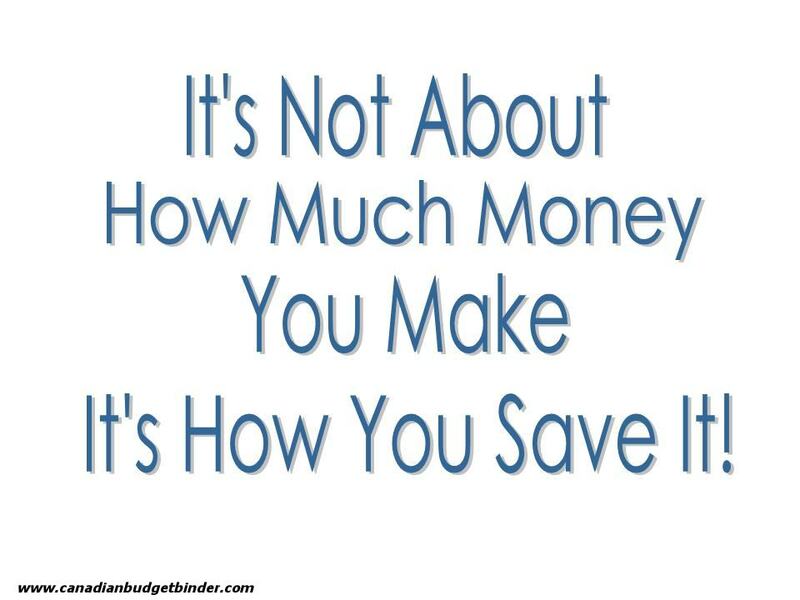 Of course time depends on how many you are making. I typically like to double up on this recipe so I have leftovers the next day for the family and yes I have to hide some for that to happen. I start with washing some medium-sized potatoes, prick them with a fork and microwave them for about 10 minutes until fork tender and with a paper towel I cut them in half. You can let them cool a bit so they are easier to handle. I scoop out all the middle of the potato and reserve for another recipe. 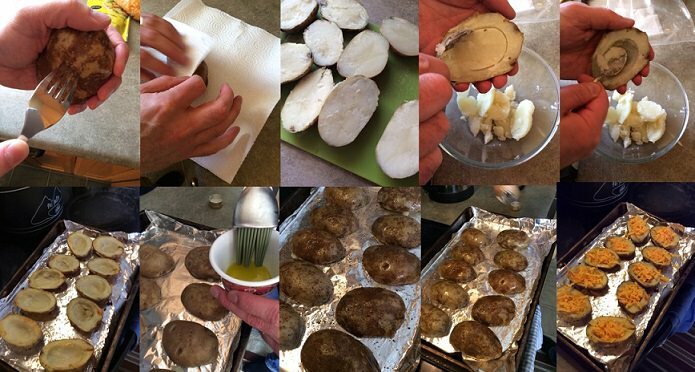 From there I line a baking sheet with tin foil and place the potato skins face down and lightly coat with olive oil and season with salt and pepper. I bake them for about 20 mins take them out, flip and do the same on the opposite side for another 20 minutes. Once they are finished baking I fill them with the bacon, onions and top with cheese and put them back in the oven until the cheese is melted and serve right away. You can serve with sour cream, Greek Yogurt, salsa or your favourite toppings. Now you can tuck into your twice baked potato skins fully loaded and delicious to eat. The twice baked potato skin recipe is pretty straight forward and I’ve shared it on What’s For Dinner at Canadian Budget Binder on the Facebook page a few times now. Mr. CBB has even made it a couple of times and raves about how delicious they are so I hope you enjoy this recipe and let me know what you think. This is a simple potato dish that anyone can make for any meal of the day. It's great to take to parties as well. Let potatoes cool down a bit after you remove from microwave oven then cut in half and scoop out the middle. Put the inside potato you scoop out to one side and use for another dish. Once 20 mins has passed take out and turn them over and again coat with olive oil, salt and pepper. You can essentially fill the potato skins with whatever you fancy. Place back in the oven until cheese has melted around 5-10 mins. These twice baked potato skins are ideal for a pot-luck as I mentioned and can be made earlier in the day to cut down on time. Cooking twice baked potatoes are not difficult and easy to transport. All you do is take the stuffing ingredients with you and cook and fill at the potluck then bake in the oven or put on the grill. Enjoy these as they are very addictive, aren’t they Mr CBB lol!! You know what Nicola, they are addictive but one thing I did differently was that I added the filling ingredients to the mash that I scooped out then refilled the potatoes. That looks delicious and easy! Thanks for the recipe! mmmm. LOl, they turned out awesome as before I was adding the mash back into her potatoes. We made them again last night. I am a HUGE fan of potato skins, and I am of the opinion that everything is better when twice baked. What do you use the potato filling for? Just curious so I can get some ideas when I’m meal planning. I have to make these for next weekend! Oh my gosh, that looks delicious! I like that you mentioned you could fill them with anything. They’re almost one of those perfect – end of week/get rid of the leftovers recipes. Looks so good Nicola!!! I was reading this on the iPad when the younger boy walked in… He looked it over as I was getting the tea ready and his Das’s morning meds…..he’s not that big a fan of potatoes with the skins but he likes the look of this…guess that means I’ll have to try it!!! I think if it was to be eaten as a snack during the game just the way you have it here would be good but if it was for a main meal then using the leftover potatoes mixed in would be the better idea..just my thinking…. Yes that’s what I did with them initially. I made twice baked potatoes last night… Similar except when you scoop the middles out you mix with bacon bits and shredded cheese. Can also add cream cheese or I use laughing cow cheese. They are delicious and with a salad can be the whole meal. That’s what I thought Nicola was telling us to do when she shared it on What’s For Dinner on my Facebook page and that’s how I made them, just like you. They were great. You can do them both ways. I’m going to try it the way she intended for us to try them as well now. I love your idea of the laughing cow cheese, brilliant!! How long do you bake them or do you use the same procedure? Thanks Nicole for sharing!